Tin Ice Bucket is for putting the beer bottles in order to cool the beer using the ice cubes. Our items are ideal for crafts,gift baskets,or decorative arrangements.You can everyday use around the home,shop,farm and garden. 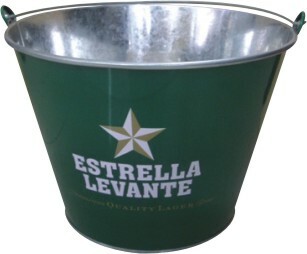 These galvanized buckets in a variety of colors and prints, 0.3mm 6 Litre Hot Dipped Galvanized Buckets. Fill them with candies, dried or plastic flowers or gifts for a shower,house warming party,table decoration or as a door prize. Galvanized: Bright Shiny appearance,which is preferred whenever appearance is important.Resist the elements-won't oxidize. Part of the Artland oasis series, an entire line of beautiful and stylish of items for BBQ's, entertaining and decorating. Looking for ideal Tin Beverage Ice Bucket Manufacturer & supplier ? We have a wide selection at great prices to help you get creative. All the Tin Beverage Bucket are quality guaranteed. We are China Origin Factory of Branded Tin Beverage Ice Bucket. If you have any question, please feel free to contact us.